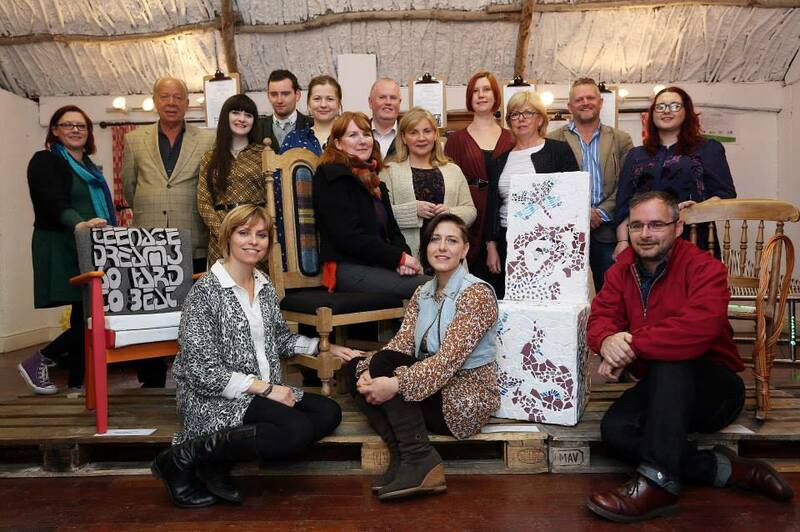 So the legend of our Legenderry Chairs project is over – and it ended with a bang! The Legenderry Chairs exhibition at the Craft Village in Derry attracted plenty of visitors, curious to view our collection of stunning chairs-turned-masterpieces – each with their own legend to tell of partnerships between local business and arts sectors. The transformation from discarded chair to work of art was miraculous in every case, each artist-business partnership coming up with a totally unique design idea to create a lasting celebration of Derry’s artistic heritage. Nuala Maguire’s chair for FirstSource makes a bold statement on Derry’s vibrant literary and musical heritage with references to Seamus Heany and The Undertones whilst also spotlighting creative members of FirstSource staff. Equally, the pair of chairs by Mary Anthony Smyth & David O’Connor for Inner City Trust beautifully recreate Derry’s shirtmaking heritage through embroidered factory song lyrics and recycled shirt fabric whilst Emmet Rock’s stunning contemporary seat for manufacturing company AllPipe appeals to Derry’s modern-day industrial activity. The creative nous and commitment shown by everyone involved reinforced why Derry was chosen for this year’s City of Culture and echoed the artistic vibrancy that plays an integral part in its identity. We hope that this example of how business and creative minds can compliment one another and produce innovative, original and beautiful results will encourage other such partnerships and continue the creative legacy of Derry-Londonderry’s legendary year beyond 2013. Take a look through our gallery to check out the wonderful results of the project. We are sure the chairs will live happily ever after with their sponsor business and were delighted to be a part of the fairytale of City of Culture 2013!